Why is Apple's Tim Cook visiting India? 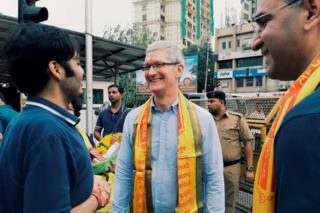 Less than seven hours after a midnight landing in India, Apple CEO Tim Cook was spotted in a famous Hindu temple in Mumbai on Wednesday. He was seen there with Anant Ambani, son of Reliance Industries chairman Mukesh Ambani, whose Jio 4G service is expected to be a game-changer for mobile internet in India by the end of 2016. Such high-speed networks would "unleash the power of the iPhone", Mr Cook had said after announcing Apple's results for the first quarter of 2016. India was the sole bright spot in those results as Apple reported its first-ever revenue decline in 13 years. While global iPhone sales fell for the first time ever, a drop of 16% from the first quarter of 2015, they rose 56% in India in the same quarter. Mr Cook's visit to India is a first for an Apple CEO. None of the California-based technology giant's seven CEOs ever visited India while in office, though Steve Jobs famously came here as a backpacking hippie looking for "answers" in the mid-1970s. If a country's importance to a global firm is measured by CEO visits, Mr Cook's score is telling: China 8, India 1. India accounts for just 1% of global iPhone sales and Apple's share of India's mobile handset sales is 1.5%. India's market is dominated by phones under 5,000 rupees ($75; £50), while Apple's recent models start at 39,000 rupees ($580; £390). Of India's rapidly-growing smartphones market, Apple has 3.4% share, according to CyberMedia Research (CMR). It ranks seventh among smartphones brands in India, though it is number two worldwide after Samsung. China, on the other hand, is the second-largest market in the world for Apple after the United States. Apple announced that it would invest $1bn in Chinese ride-hailing app Didi Chuxing last week to "better understand the Chinese market", Mr Cook told Reuters. He came to Mumbai straight from Beijing. The Chinese economy is struggling, though, and the decline in phone sales there contributed to Apple's revenue loss. iPhones account for nearly two-thirds of Apple's global revenue. For Apple, the almost-untapped Indian market could help revive its fortunes. Mr Cook is expected to apprise Prime Minister Narendra Modi of Apple's investments in India this week. But the firm has already made two announcements. Apple's first development centre in India will be in Hyderabad, the capital of the southern state of Telangana, where over 150 Apple developers will work on Apple Maps. The centre would later move to Apple's own campus in or near the city and expand to 2,500 employees, government sources told The Hindu newspaper. On 18 May, Apple also announced a "design and development accelerator" in Bangalore, the southern city considered to be India's tech and start-up capital. The centre, to be set up in 2017, will provide support to iOS app developers in India. With Mr Modi's focus on his "Make in India" programme, the discussion is almost certain to veer to manufacturing. Will Apple make iPhones in India? Not on its own. Apple doesn't make its iPhones: they're made by Taiwanese firm Foxconn in China. Last August, Foxconn announced plans to invest $5bn in a plant for multiple brands in the western state of Maharashtra. Reports this year said Foxconn was likely to set up a $10bn plant in Maharashtra to make Apple devices. While these plans have not been confirmed yet, the firm has taken up space in and near the state's capital, Mumbai, for making handsets for Chinese vendor Xiaomi and Indian operator Reliance Jio. Local manufacturing, with incentives and lower duties, is likely to allow Apple to reduce its iPhone prices. In a price-sensitive market, iPhones are expensive and fall in the "premium smartphone segment". Most phones in this segment cost more than 30,000 rupees ($450; £300) and they accounted for just 3.4% of India's total mobile-phone sales, or 3.3 million handsets in 2015, according to CMR. But in this premium segment, Apple has 44% share, nearly level with market-leader Samsung. Even in 2016, when Indians are expected to buy five million premium smartphones, 96% of the smartphone market will remain below $450. Apple has no recent models, less than a year old, below this price point. And manufacturing in India will not bridge the gap for Apple's $600 handsets. Older iPhone models are cheaper, but their sale is low. The 5s is nearly three years old and Indian buyers, though price-conscious, have not shown much interest in buying old models. Apple, therefore, has a problem. Its newer models are expensive and its cheaper models are too old to be interesting for Indian buyers. One answer is refurbished phones, which Apple sells in other markets. It calls them "pre-owned and certified", explaining that these are current models, often returned by a customer. These models go back to the factory to be tested and certified. They emerge with a new identity (an IMEI number) and warranty. Analysts say this could be a winner for Apple because Indian buyers will be more willing to buy such phones at a discount. Selling refurbished current models will increase Apple's share of the 15,000 to 30,000-rupee segment, which accounted for 5.6% of the smartphone market in the first quarter of 2016, according to CMR analyst Faisal Kawoosa. "With the brand equity of Apple, it can easily grab over 40% of this segment, almost doubling its sales," he says. "This could take Apple to selling four million units in 2016 in India." The government may not allow Apple to sell refurbished phones in India, citing concerns about "dumping of old models" and "e-waste". Industry insiders say this appears to be a result of intense lobbying by rival handset vendors with the government to disallow Apple from selling refurbished phones. Apple India sources say they have no official communication from the authorities on this. This is likely to be a subject of Mr Cook's discussion with officials in Delhi. Another point of discussion would be the company's plans to open Apple-owned retail stores, thus far blocked by Indian regulations that require 30% of the goods in the store to be sourced locally. Delhi has said it could waive the rule for companies with cutting-edge technology and Apple is hoping to deal with this obstacle during Mr Cook's visit. Mr Cook began his India visit in Mumbai by praying to the Hindu elephant god, Ganesha, revered as the remover of obstacles. And it seems Apple is going to need a lot of help from Ganesha. Is India’s $3.60 smartphone too good to be true?